Raising kids is expensive. The numbers bear this out: The U.S. Department of Agriculture reported that in 2015 a middle-income family spent an average $12,980 each year on each child. To raise a child from birth through age 17, it would cost married parents an average $233,610. And these figures don't include the cost of a college education. Because raising children — not to mention buying cars and homes to accommodate them — is an expensive task, it makes sense to set certain financial goals for yourself before you start a family. Being financially prepared for children can make raising them, and paying for this process, a far easier task. Here are a few money goals to set before you start having children. Children come with unexpected expenses; everything from $200 for an emergency room visit to a surprise $500 bill from the dentist. You can prepare for these expenses by creating an emergency fund. As its name suggests, an emergency fund is an account that you only tap to cover unanticipated necessities. With an emergency fund, you won't have to resort to paying for unexpected expenses with a high-interest credit card. Most financial experts recommend that you have at least six months' worth of daily living expenses saved in your emergency fund. That might seem like a daunting goal, but you can get there by steadily putting away even just $100 every month. Your credit score is an important number. Lenders use it to determine if you qualify for mortgage, auto, personal, and student loans. They also rely on it to set your interest rate, with a high score usually equaling lower interest rates. You'll need a steady income to pay for the expenses involved in raising children. The best way to get this income is to build a stable career in your field. Make sure you have several years logged in your field before you begin having children. While there are no guarantees that you'll never lose your job, the odds will be lower if you've already established yourself in your field. And if you do lose your job, you'll have an easier time finding new work. 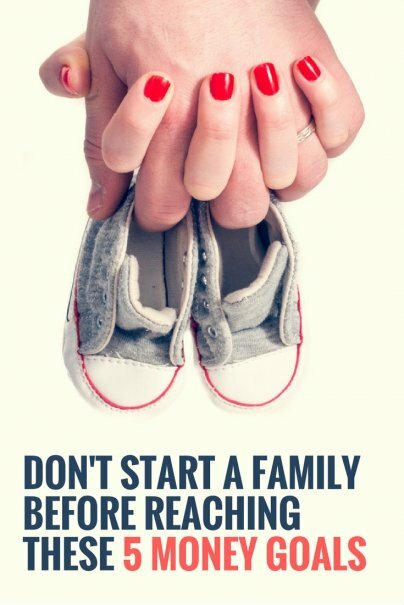 Retirement might seem far off, especially when you're thinking of starting a family. But it's never too early to start saving for retirement. The earlier you start, the more dollars you have once you leave the workforce. Before you have children, start socking away money each month for retirement. The easiest way to do this is to sign up for the 401(k) plan that your employer offers. This way, your retirement funds will be deposited automatically with each paycheck. College might seem far away, too. After all, your children aren't even born yet. You're focused more on paying for preschool than on picking a college. But you should start planning for your children's college education before you even begin building your family. The average class of 2016 graduate took home $37,172 in student loan debt, a number 6 percent higher than the year before. That amount continues to rise each year. You don't want your children to be burdened with student loan debt as they become young adults.